The 1 today is on foam pads and the red bear is on foam pads too. That's not girly, it's colourful! Er, hello, he's 1. Who is it will decide it's girly? Oldies like us. It's perfect, he'll love it, with all the enthusiasm of a 1 year old, before passing on to the next thing to catch his eye. Us oldies however, can admire how bloomin clever it is and think, I wish I could do that. Nice one! Im sure he'll love it, its great! It's lovely, would say its quite neutral. 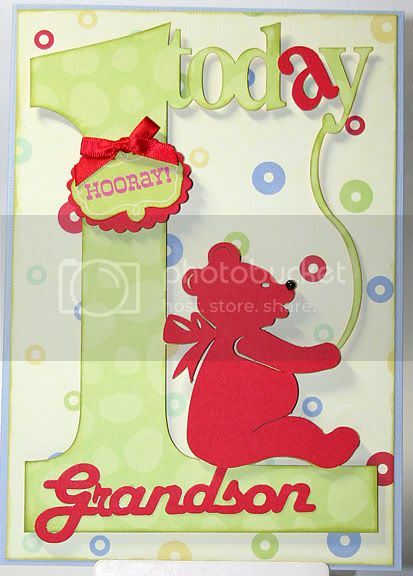 Maybe the Grandson done in blue would make it more boyish, but I doubt anyone will really think its girly. It's not girly at all - pink would be girly. It's lovely. Can't believe he's one already - gone so quick. Great card Lorraine, not girly. Not available in a shop near anyone, so totaly unique, spot on. Why do you think its girly? It's not pink! Can't see this one either, thats three pictures in different place sofar, but I can see Jo's. I love it - and not at all girly. Reminds me, I have to make a card for my great niece this weekend. On the list it goes!!! Oh what a ,lovely bright vibrant card, ideal for boy or girl.